We are delighted to announce that the group exhibition “Stèles IV: VIVE LE TRAVAIL ” in Ying Space will be held on May 20th. Participating artists include: Chen Yifei, Ge Yajing, Han Haoyu, Liang Hao, Li Yong, Nhozagri, Qin Lingsen, Qu Yeyang, Tang Shi, Wan Zhenyu, Xu Liwei, You Ada, Yan Hongchi, Zhang Xinyi, Zhu Yingying. The “Stèles”, as a long-term permanent project of Ying Space, is officially launched last year. It takes exhibition as the opportunity tofocus on, observe and explore various parallel painting tendencies in Contemporary Chinese art In this project, curator also takes the display itself as creative practice parallel with participating artists, build a discussion atmosphere, and involve different oriented practices in different topics of the top priority in the painting field. The exhibition will be opened in December 11th, 2018 and will continue until January 13th, 2019. In the process of painting, I realized that to create a character requires knowledge and familiarity with people of all walks of life. First, it is necessary to feel for those characters, then to generalize them before they come into being, with idealistic characters arising to mind. Here, sentiments and figures are usually intertwined. Since its establishment in 2013, Ying space has provided supports for the art plan of many artists and curators, including investigative curator, experimental art project, art writing, independent publishing, performance, screening, lectures, etc., the exhibition covers a variety of medium such as painting, video, installation, sculpture. Meanwhile, Ying space has become the bridge between art creation and the collectors, as well as the art museums and the commercial crossover projects. Ying Space has two long-term permanent projects: “VPN” and “Stèles”. Launched in 2016, “VPN” was focused on the experimental art creation based on the Internet culture. 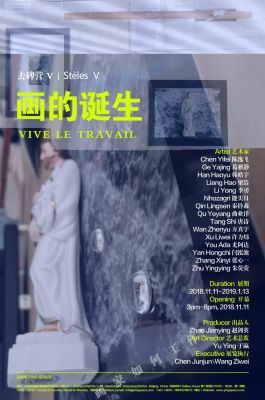 The “Stèles”, which was launched in 2017 by Ying Space, aims at observing, researching and thinking about the traditional painting and sculpture. In recent years, Ying Space has collected, compiled a large number of painters’ and sculptors’ information, and visited a wide range of artists’ studios nationwide. In addition, Ying Space had an extensive and in-depth communication with the theorists who concerned about this field, and planned to discuss the issues of contemporary painting and sculpture by holding a series of group exhibition, publishing and symposium. The word “Qubeiying” is an interesting place name, and it was found by our gallery staffs when they were trying to look for an art storeroom. Inspired by this word, “stèles” was decided to be used as a title of the project. “Stele” is the spiritual space for Chinese people. It stands in the vast expanse between heaven and earth, and can be regarded as the trinity of plastic arts, literature and architecture. It is not only a part of landscape, but also the text in the landscape. We choose “Stèles” as the general title of our project, representing the value orientation of Ying Space. That is to say we do hope that all the creations and critical writing practices, which are supported and exhibited by Ying Space, could be rooted in the social reality and contemporary culture, and could make a profound influence and valuable expression to the society as well. ARTLINKART STAY TUNED is available on iPhone for more art infos.